A customer came to me and said, “I must have rocks in my head for putting mulch on my landscape year after year”. And so came about the idea to use ornamental stones instead of mulch. But seriously folks the man has a point. Mulch gets degraded over time and must be replaced often at great expense. Ornamental stones pretty much lasts forever and provide much of the same benefits of hydration preservation that mulch will do for your landscape with far less maintenance. At Northampton Gardens, Inc. we are experts at designing your landscape using a wide variety of ornamental stones that will give you an aesthetically pleasing look and low cost maintenance. All shapes, sizes, and colors abound in nature and we are sure to find the right match for you and your property that will fit every budget. We encourage you to take a moment and look at the various photos of some of our projects that included the use of ornamental stones. 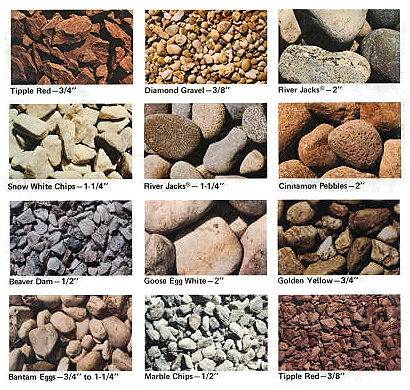 You will see flagstone, river jack, snow white chips, goose eggs, red tipple, and the use of boulders to accent a natural look. We take great care in preparing your landscape for the introduction of stones by first placing a special fabric on the dirt surface that will prevent weed germination as well as loss of stones into the soil over time. This installation may take a bit longer than that of mulching and be more expensive, but you will have a colorful long lasting landscape with little or no maintenance. You will also benefit by having fewer animals, particularly dogs, getting into your surrounding shrubs or plant material as dogs don’t like to dig in stones. Whether you have some existing landscape beds that you would like to convert to ornamental stones or you would like to create something new, we invite you to a FREE consultation and design. Give us a call at (215) 766-2200 or e-mail for an appointment today.